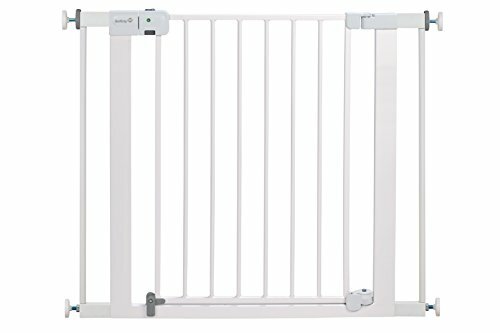 Are you looking for a safe and reliable baby gate? Then you may want to check out the Safety 1st Easy Install Auto Close Walk Thru Gate. The Safety 1st Easy Install Auto Close Walk Thru Gate adjusts to fit doorways and openings between 29 and 38 inches wide and is 28 inches high. The door is made to close and lock automatically, and also features a locked/unlocked icon on the handle. This will let you know if it is properly locked. The Safety 1st Easy Install Auto Close Walk Thru Gate is easy to install, as it is a pressure mounted gate. It is easy to walk through, and the auto-close feature is quiet so that it won't wake your sleeping baby. This also works well with pets. As of this writing there were 234 customer comments and 59 answered questions for the Safety 1st Easy Install Auto Close Walk Thru Gate. I've read through the customer feedback, and then condensed the results into this review. I hope that this helps you when shopping for a baby gate. "For pet containment this gate is awesome! Closes automatically (eliminating the chance of the kids forgetting to close it)." A SecureTech Indicator lets you know that the gate is locked in place by showing you a photo of a green lock that is shut or a red lock that is unlocked. The gate is made to automatically shut each time it is opened and then shut automatically at which time you should see a green lock. At the bottom of the gate are optional swing stops that you can easily adjust to make the gate not swing open in each direction. The gate will swing both ways unless one of the swing stops is down. The gate will not swing at all if both swing stops are down. "I just installed this gate and absolutely love it! It's heavy duty and the locking mechanism is top quality. I was a bit hesitant to get a door that closed automatically because if it made a loud noise while closing I would have hated it. But I am delighted that it closes slowly and very quietly." "I went with this gate based on its reviews and price. Did not disappointment. Its very sturdy, works exactly as represented." "The pressure mount holds securely. If our 90lb dog can't get it to budge, neither will your toddler." The gate comes with 2 extensions, allowing it to install in openings 29 to 38 inches wide. This is a nice feature because you can use it on a doorway and then later have the option of using it on a different sized doorway. If you are wanting an inexpensive gate that automatically shuts behind you, the Safety 1st Easy Install Auto Close Walk Thru Gate is a great choice. It is a pressure mounted gate as opposed to being a hardware mounted gate, so it should not be used at the top of the stairs. Even though this is a secure gate, you should never use a pressure mounted gate at the top of the stairs since it is not as secure as a hardware mounted gate. Optional swing stops are featured on this gate so that you can easily adjust to make the gate not swing open in each direction. The gate will swing both ways unless one of the swing stops is down. This is not a fancy looking gate, but for what you get at the price you will pay this is a great choice.